One of the first applications of polyethylene pipe and Gajeske’s first market to serve, gas distribution is now an industry in which over 95% of the pipe installed is polyethylene. 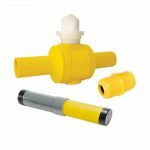 Gajeske carries a complete portfolio of gas distribution products including pipe, fittings, meters, regulators, service risers, and accessories. 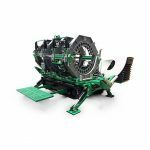 We also offer McElroy fusion equipment, electrofusion processors, and squeeze tools for sale and rent, providing a complete package to our gas distribution customers. Gajeske has been involved in numerous Gas Distribution projects over the last 30 years. Walsh Ranch in West Texas is a multi-phase project that will be ongoing for the next 25 years as KLP construction installs thousands of feet of gas pipe. Harvest Meadows – Westlake / Roanoke is a multi-phase subdivision in which Gajeske has supplied multiple shipments of gas pipe and conduit. Entrada-Flowermound – Partnering with Willbros and Kodiak, Gajeske is supplying gas distribution piping and related products.